Adult male at the nest about to feed a small insect to two newly hatched nestlings - June 2017. Adult female on her nest in the woods. Adult female American Redstart on her nest in the woods. American Redstart Video http://birdnote.org/video/2013/12/american-redstart-singing Click link. Adult male American Redstart feeding young. A quick up close look at an male American redstart feeding it's young in the nest. I've observed and filmed this species of bird on and off over several seasons and know it well. Redstarts are small birds averaging 5 inches in length. 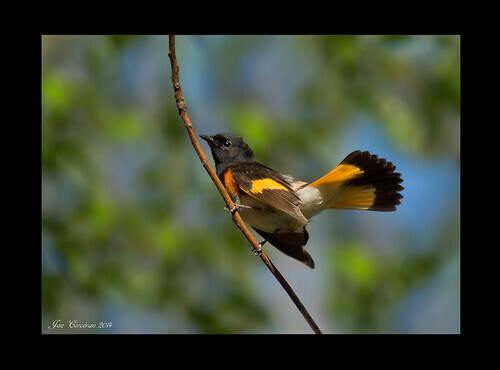 Adult male American Redstart in action. Known for drooping their wings and fanning it's tail, this very short video shows the adult male doing just that. Filmed during spring migration they weren't making any sounds so I added some to give an idea of what they sound like. They are not easy to film when they are in the action mode. A quick glimpse and they dart off and are gone. A brief look at the adult female American Redstart. I came across redstarts several years ago. Found them fascinating little birds. Observed them and did my best to capture them in video. Decided I had done enough on them, but they showed up one overcast day in May. They were in action hunting for insects. I got done at work early that day and was getting kind of bored so walked out into the back yard and there they were. Thank God for small wonders. No longer bored I thought what they heck and I filmed them again. It was all filmed that one day in May. The next day they were no where to be found. I added some fast paced background music as the birds were moving quick. I do not own the copyright to the music titled "Alive" by the group Echelon. I have permission to use it and feel it compliments the video quite well. I am thankful they allowed me to use it. “Watching Redstarts” The American Redstart filmed during the 2017 nesting season. 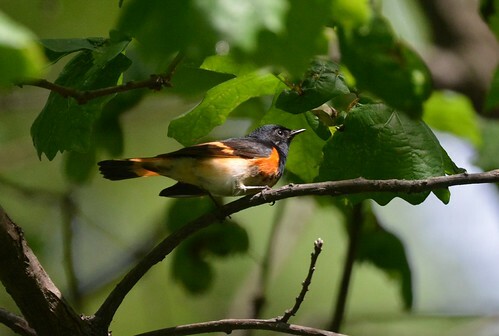 I filmed these American Redstarts during the late spring/summer of 2017 in the woods at my brothers farm in NW. Mn. There were 4 different pairs. Contains natural nature sounds with added background piano music. An intimate look into the lives of American Redstarts during the nesting season. I looked out late today to see a Painted Redstart jumping in and out of our "water feature." We had 2 females last night in addition to a Yellow-throated Warbler. The light was low, but there was just enough to capture her enthusiastic bath. Warblers have been described as the butterflies of the bird world. Although this bird is not called a warbler in its name, it is called an American Redstart, it epitomizes this characterization of warblers. It is very flighty and very bold in its coloration. 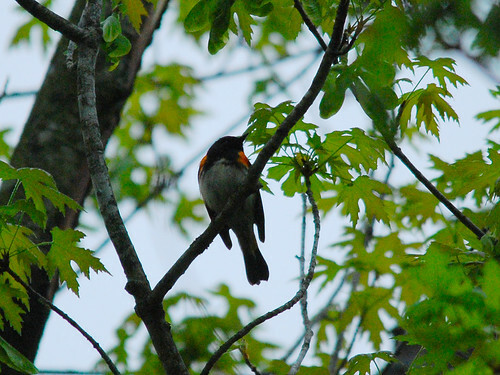 The American Redstart is a common warbler found in deciduous forest understory especially near water. The male has a glossy black head and body with radiant orange patches on sides, wings, and tail. It has a white belly and undertail coverts. The female has gray-olive upperparts, white below with yellow patches on her wings and tail. This warbler is a very active flycatcher. It often fans its tail and spreads its wings when perched. The song is a "zee zee zee zee zwee". I'm pretty sure this is an american redstart...correct me if Im wrong...A very elusive bird visits my window branch and lets me film them for the first time! Just when I was getting into the groove of filming- the window feeder regulars (mourning dove, tufted titmouse) scared them off. Multiple male and female birds in narrow track of forested area in backyard. Noted splaying of tail and swooping to catch insects while eating. spotted in woods. Never seen one before. Location: Norman County, MN in the woods at my brothers rural home. Have never seen one in my yard before. Pretty exciting! Was hanging out by our little pond for hours. Unmistakable markings, especially the tail.